Bring all the ingredients together to boil. Bring to boil.Simmer for 5 minutes. 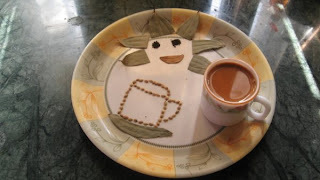 Strain or filter tea into a cups and drink hot. Note- This tea recipe with / without ginger also its taste good. Great presentation..tea sounds too good.. Very fragrant tea.Nice presentation with bay leaf and coriander seeds. Never used coriander seeds before. Lovely presentation dear! Nice tea recipe dear well presented n well explained. using coriander seed is new to me.. it looks so spicy adn yumm ! will have it in the evening..nice presentation.Loved the saucer with ur creative work..nice da..
That is some nice creativity on the plate decoration. Love it !!! Adding coriander seeds to tea is new one. Looks really good. I am abig fan of masala tea but never tasted with coriander seeds before This is new to me. Very nice masal tea dear. Beautiful presentation and you have a great collection. Thanks for those lovely comments Divya. Lets Keep visiting. Divya, this tea is my fav. love to sip on it morning and evening. 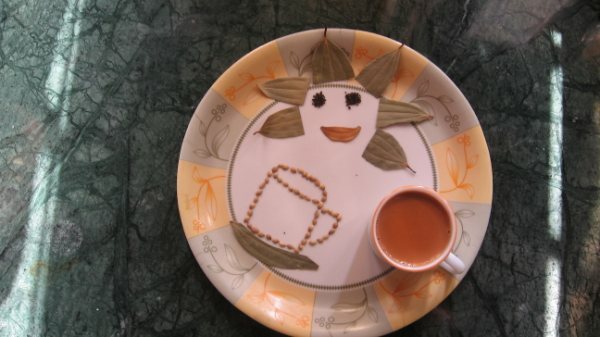 Flavorful tea divya,apt for the evenings dear.Cute presentation as well.